The driver of the bus caught in a viral video swerving through lanes at Commonwealth Avenue, Quezon City claimed that he had to rush due to loose bowel movement (LBM). 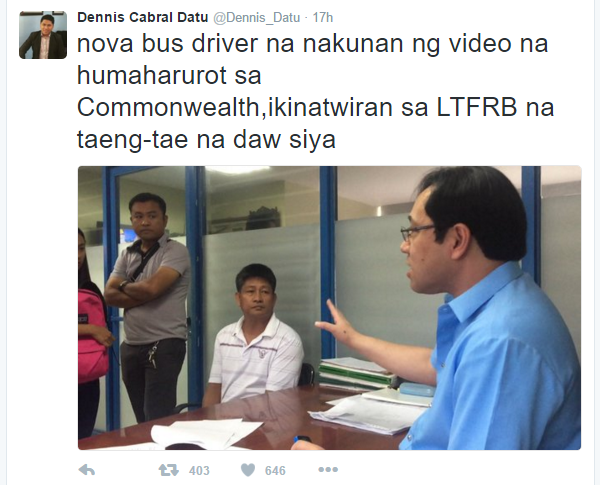 Nova Bus driver Jovencio Guingab appeared at the Land Transportation Franchising and Regulatory Board (LTFRB) office on Tuesday, March 29, to apologize. He claimed to have suffered from an upset stomach after eating kalamay na biko (sticky rice cake with caramelized coconut milk topping) for breakfast. Apparently, the reason he was driving too fast was to look for a toilet on the other side of the road. Guingab struck a van in the process. It was captured by a dashboard camera in the car of Mikhail Argel Tan, who posted the video on Facebook last March 23. The bus conductor reported the incident to their company and the passengers were given a refund. Nova Bus slapped Guingab with a one-month suspension and made a settlement with the van driver for P10,000. 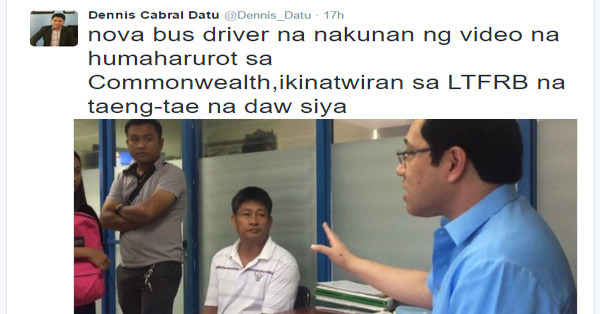 However, the LTFRB will recommend sanctions against Guingab for reckless driving.